As the number of wealthy individuals around the world increases, private banking and wealth management companies have grown to keep pace. After the fast growth the long term success is predicated on both winning and keeping clients, making a client-centric model a must. Private Banking: Building a Culture of Excellence provides a clear, easy-to-follow guide to building a committed base, written by an industry expert. Presenting an overview of the elements required to build a successful and client-focused private bank that delivers the kind of care and excellence wealthy clients demand, the book even includes real-life examples for a better understanding of concepts and, to help you achieve your goal. 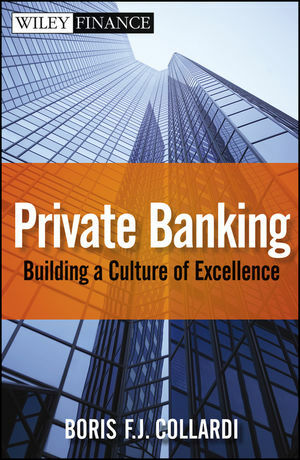 Private Banking provides useful, hands-on advice for building a strong, lasting business in the private banking sector. BORIS F.J. COLLARDI is Chief Executive Officer of Julius Baer Group Ltd., the leading pure-play private banking group, based in Switzerland. He oversees all operational issues on both a national and international scale. Before joining Julius Baer in 2006, Collardi spent twelve years with Credit Suisse and contributed significantly to its successful build-up and the expansion of its private banking business in both Europe and Asia. During his years with Credit Suisse, he attained the positions of chief financial officer and head of the corporate centre within CS Private Banking. Collardi combines extensive leadership experience with proven expertise in the successful implementation of ambitious strategic projects. His international work experience stems from six years spent in Asia and the UK.